Vacation Time is Just Around the Corner...Where Will Your Family Vacation Take You This Year? Whether you're planning a getaway for two or for the whole family, taking time to spend together is excellent for everyone. But choosing the perfect destination? That can get tricky. Research shows that Florida is among the top travel destinations in the world, known for its sandy white beaches and relaxing atmosphere. Beach vacations may seem like they've all been done before, but you may be surprised at just how much beach towns like Sanibel, Florida have to offer. If you're looking for a quiet, beachfront condo getaway, far from all the chaos and color of big theme parks and people, Sanibel Island may be the perfect place for you. With only 6,000 permanent residents and a strict building code that prohibits buildings from being higher than three stories, you may feel like you've discovered Florida's best kept secret. 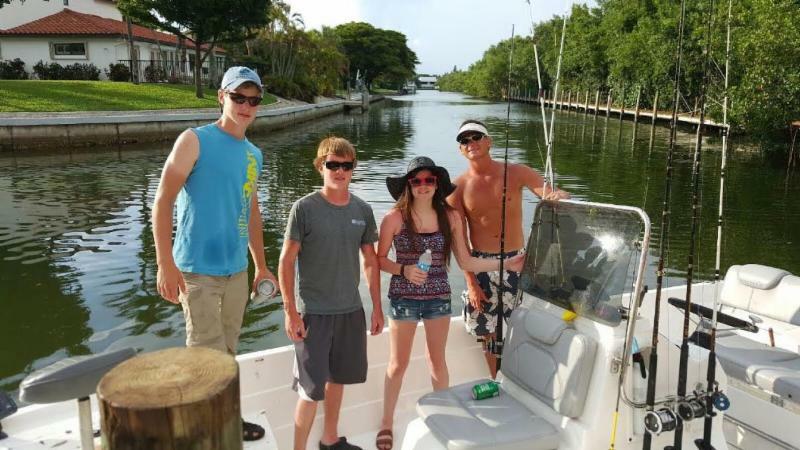 What is there to do in Sanibel? If you think every beach town is the same, you're wrong. 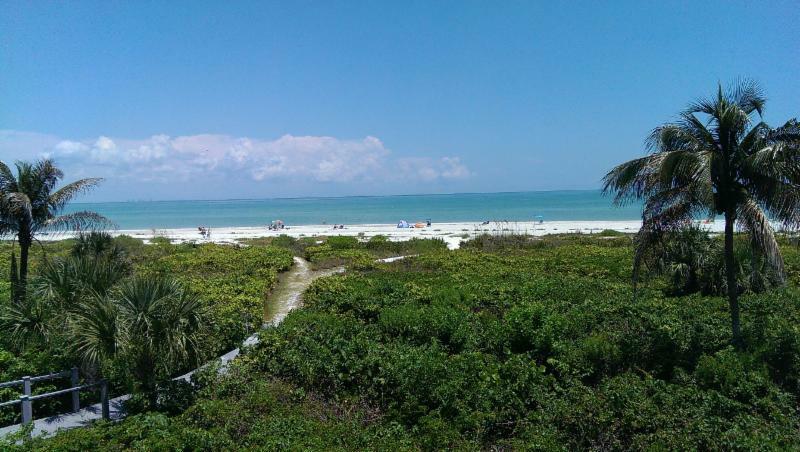 Although many a vacationer can be found in their vacation condos or lounging on the beach, there's more than tanning to be done on the beaches around Sanibel condo rentals. 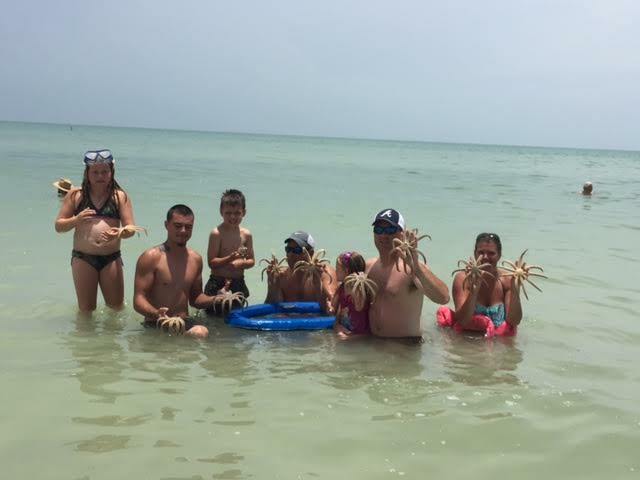 Some of the most popular activities include Sanibel fishing, bird watching, and shell hunting. Shell hunting is particularly popular among families, especially those with early risers! Over 250 different kinds of shells have been identified on the beaches of Sanibel, and early morning is the best time to spot them. Is it a good spot for couples? 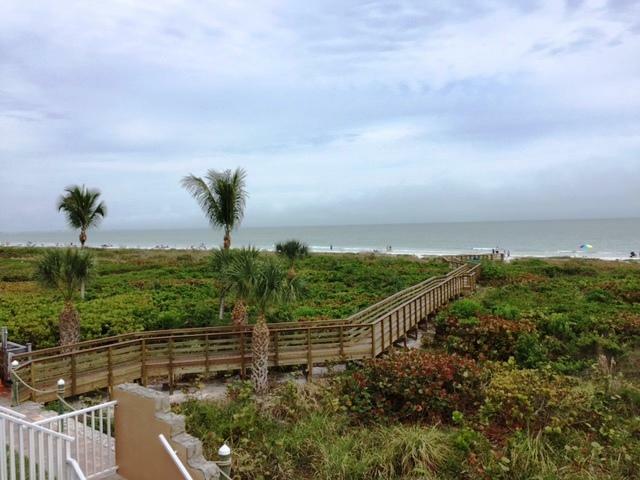 Vacation condos in Sanibel are perfect for any kind of vacation. You can choose between one or two bedrooms, and each condo has a full kitchen and comes stocked with beach supplies. Like a home away from home, you can stay in and plan a cozy dinner, or take advantage of all the fine dining options the island has to offer. Whether you're looking to plan a romantic getaway and want to look at one bedroom beachfront condos, or the whole family decides on a poolside stay, there's a place for everyone. If you're bored with the same old beach vacation every year, Sanibel may be the perfect place to leave you feeling refreshed. Why wait to plan your next vacation? We’re so close! It’s almost time for summer vacation and you know what that means: rest, relaxation, and fun in the sun! Unfortunately, travel often comes with a side of stress as delayed flights, short layover times, and long airport security lines can take their toll. Don’t let travel complications ruin your perfect getaway. Use some of the following tips and tricks for a stress-free airport experience. Fly under the radar: When you go online to book your flights, hotels, or vacation rentals, enable private browsing to search incognito. Travel sites often track your Internet activity and have been known to raise their prices simply because they see that you have visited their website before. Avoid wrinkles: Few things can ruin an important business trip or a destination wedding like unpacking your clothes to find that they have become totally wrinkled inside your suitcase. Even the most skilled at folding clothes encounter this problem, but here’s a hack: wrap your clothes in tissue paper. You’ll be surprised to see the difference a bit of paper can make. Roll ‘em up: You can save space in your suitcase by rolling your clothes rather than folding them. This is also another way to prevent unsightly wrinkles and creases. Stuff your shoes: Roll up your socks and underwear and stick them in your shoes. Don’t let any empty space go to waste. Keep your collars crisp:Once your nice shirts are neatly folded, keep the collar crisp and round by rolling up a belt and sticking it in the neck hole. Recycle: Instead of buying new travel-sized toothpaste tubes and shampoos, fill up your old ones once they are empty. Save water: Everyone knows you can’t bring a full bottle of water through security. Instead of buying a brand new bottle of water on the other side, keep an empty water bottle in your carry-on luggage and refill it at a drinking fountain before getting on the plane. Another way to create the ultimate vacation experience is by choosing the right destination and vacation accommodations. 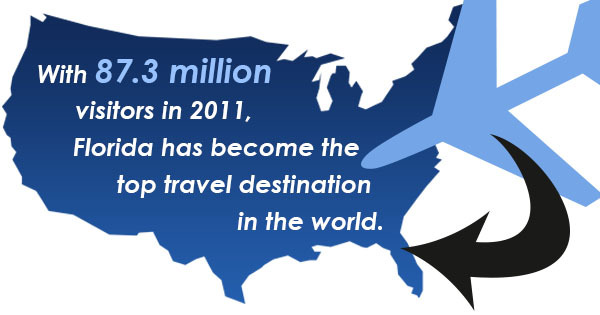 With 87.3 million visitors in 2011, Florida has become the top travel destination in the world. And why not? 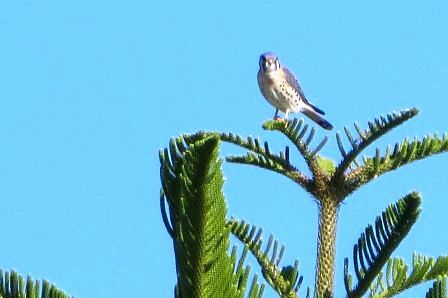 An average summer temperature of 82.7 degrees is reason enough to make the trip to the country’s southern-most state. 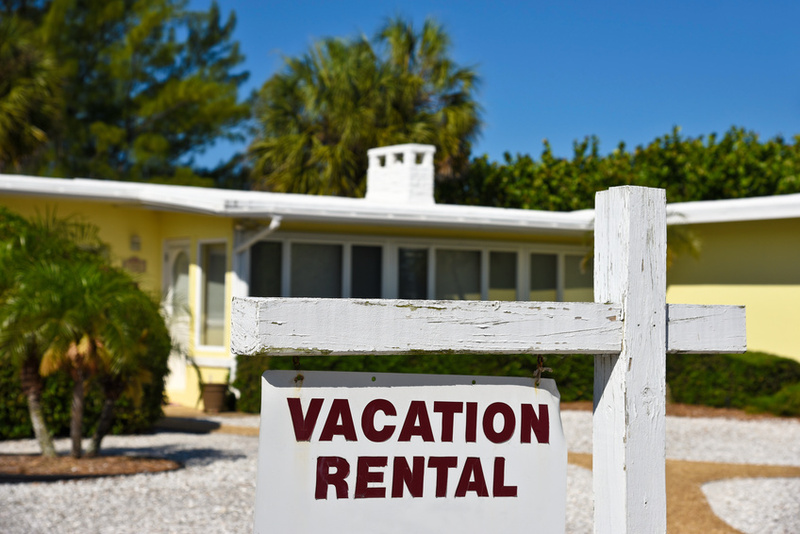 When vacationing in the Sunshine State, you can maximize your relaxation by choosing to stay in one of the area’s many gorgeous oceanfront vacation rentals or island condos. With more privacy and fantastic prices, weekly vacation rentals are definitely the way to go. 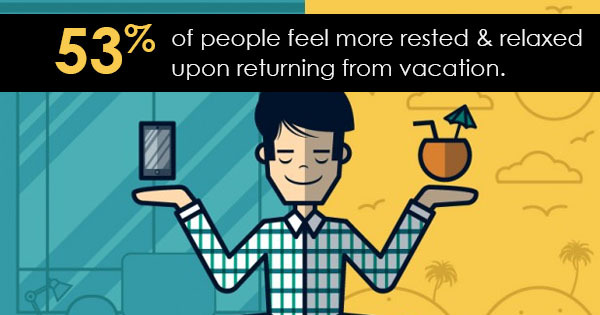 More than half of American vacationers feel more rested and rejuvenated after they return from vacation. By using a couple easy travel hacks and choosing the right location and accommodation, you can return from your trip feeling like a whole new person. A recent survey revealed that just over half of people feel more rested and relaxed upon returning from vacation. But if only 53% feel relaxed, then what are the other 47% doing wrong? Isn’t the purpose of vacation to come back feeling well-rested and rejuvenated? If you are one of those type-A workaholics, you are probably pretty good at what you do. But let’s face it: relaxing is not your strong suit. You probably don’t feel refreshed after vacation because you never truly took the time out to just do nothing. Chances are, you brought that same go-getter attitude to the beach with you, and that can be exhausting. Here are some tips on how to let go and make the most out of your leisure time. Choose the right location: Go someplace calm, serene, picturesque. If you think you are going to feel good after a weekend at an amusement park, think again. You need to give your senses a break. No place on earth is more soothing than a clean beach with a warm breeze. Choose the right vacation accommodations: Hotels are overrated. They are crowded, loud, overpriced, and about as far from leisurely and serene as you can get. For privacy and ultimate relaxation, check out beachfront condos and other types of private vacation rentals where you can enjoy your own space away from the crowds. Don’t overschedule: Slow down. Be flexible. You are so used to planning out your day to the very last second, but on vacation, you just need to loosen up and listen to your own natural rhythm. Don’t look at your watch. If you’re hungry, eat. If you’re tired, sleep. Around 49% of people say that they sleep later when they are on vacation. Try it! There’s no rush to be anywhere. Bring on the romance: At least four out of 10 travelers report that they feel more romantic while on vacation. Bring along your significant other and take some time to bond. How often do you really get to just be together during your busy day-to-day lives? What else can you do to make sure you maximize your relaxation time on vacation? If you have any of your own tips and tricks, feel free to share them in the comments section! For now, don't spend too much time planning it out. Go online, check out vacation condos, and get yourself to the beach. Longest Beach Boardwalk on Sanibel Island! We are very proud to introduce our newest property improvement, a 290 foot beach boardwalk! 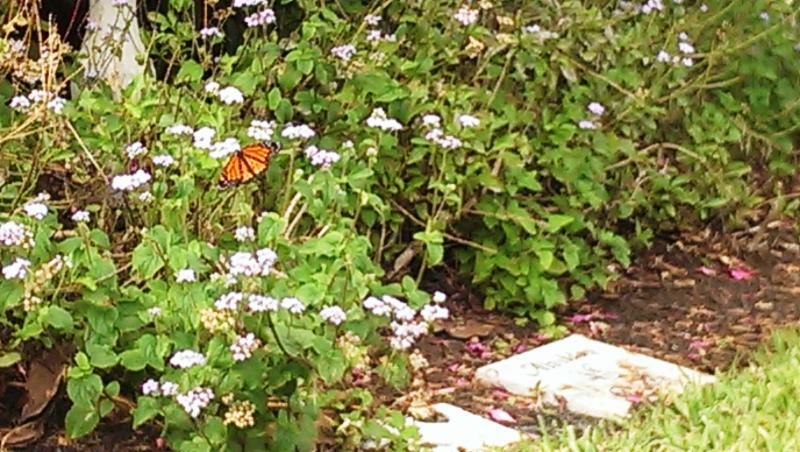 The summer rains will no longer be an issue, and the elevation allows guests a stunning view of our Sanibel beach as well as the native vegetation and wildlife. 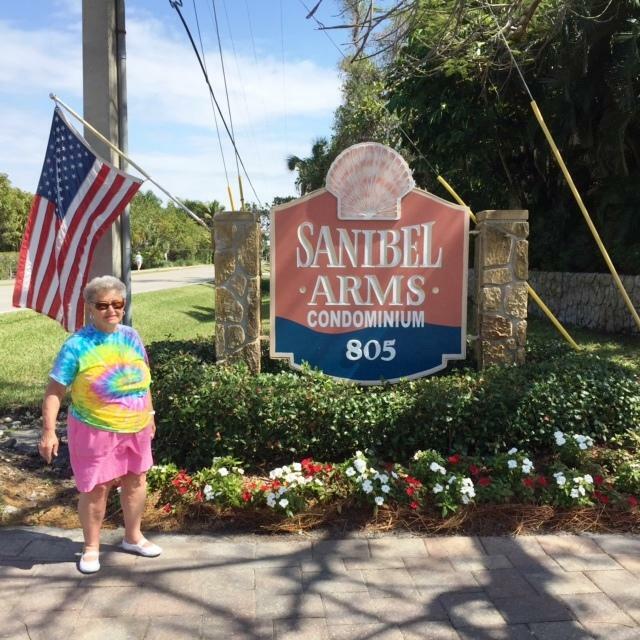 Gretchen from Michigan has been staying with us at Sanibel Arms for about 12 years. She comes down every winter with her brother and family. Gretchen especially enjoys sitting by the pool chatting with new and old friends. This year Gretchen bought, and proudly wore one of our colorful new tie-dyed t-shirts! 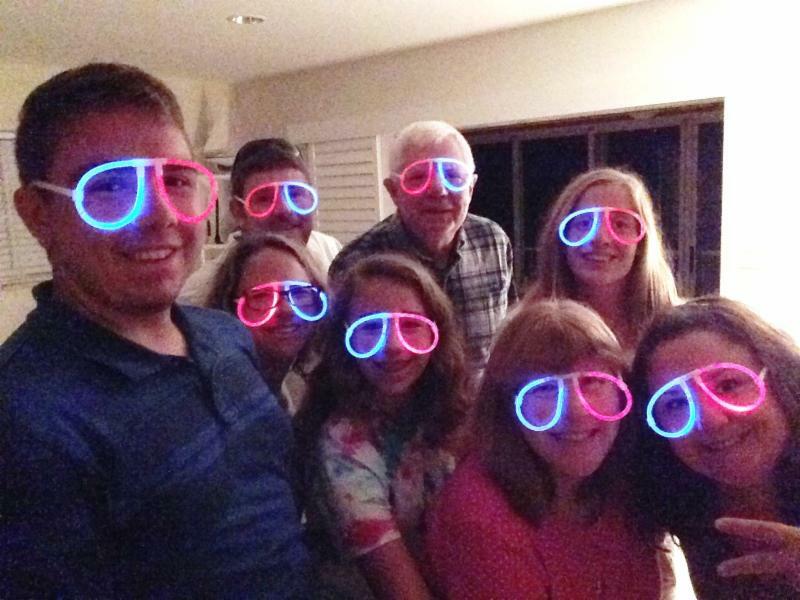 We certainly love our returning guests "Extended Family!" Bring Your Boat or Rent One! 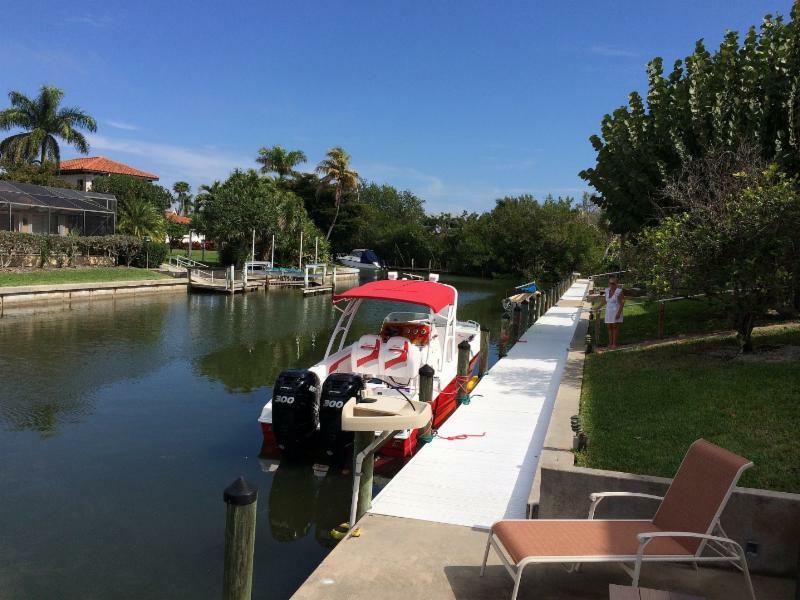 Sanibel Arms is one of the few properties on Sanibel with FREE boat dockage. You will also find grills and picnic tables along our 300 feet of dock space. Many of our guests who stay in our Dockside condos say it is because of the quiet and peaceful dock where manatee and dolphin play. 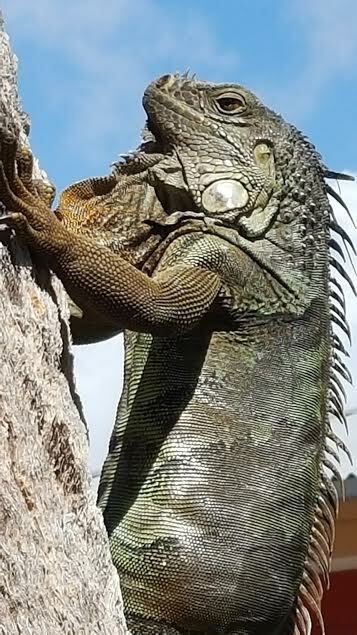 Stan and Emily from Maryland shared some fabulous pictures of Iguana they photographed on Sanibel in March. 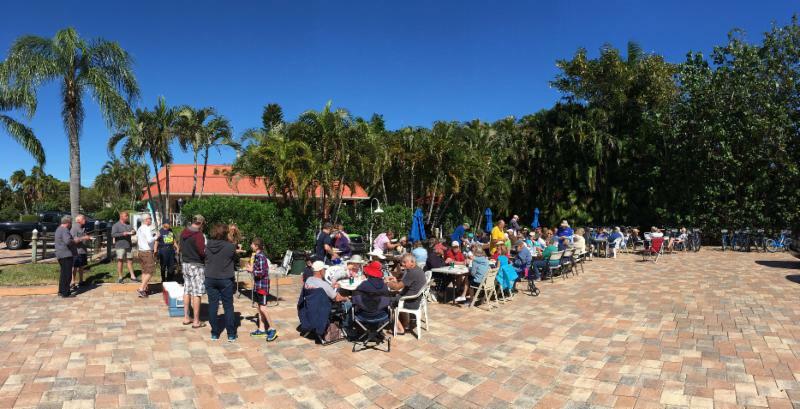 Our winter guests (Snowbirds) once again enjoyed the opportunities to mingle and get to know each other through continental breakfasts and picnics. David and Nancy from Pennsylvania provided the hot dog cooking and world famous beans while other guests brought pot luck dishes to share. A great time for all! 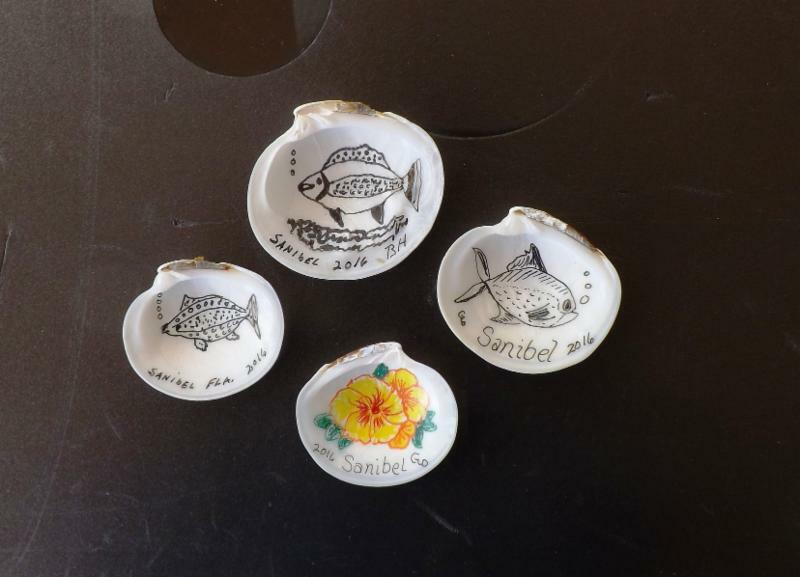 Glenna from Virginia began shell doodling last year while staying at Sanibel Arms. 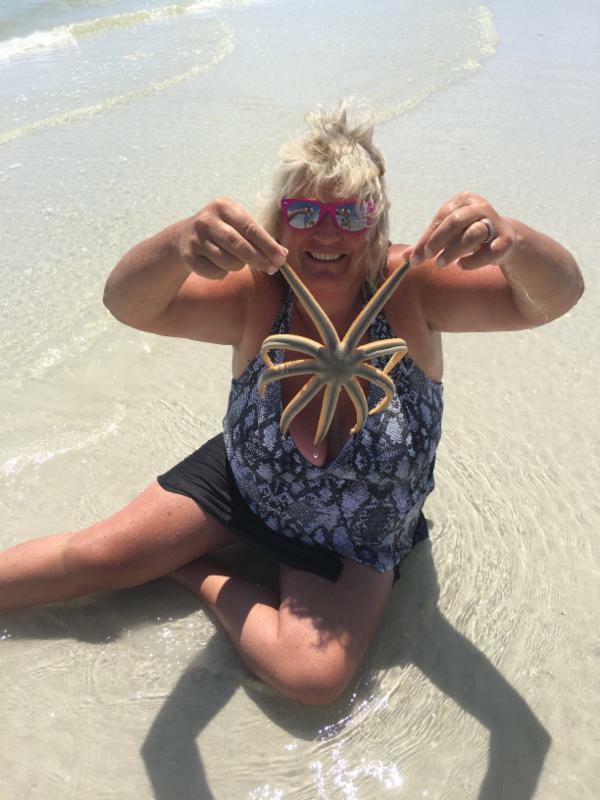 She loved making people smile with her beautiful designs which are all related to Sanibel vegetation and wildlife. Other guests were so inspired by her artistic designs so she began teaching . Bobby, also from Virginia, has always liked shells and unusual artwork, so when Glenna showed him what she had created last year, he was hooked. 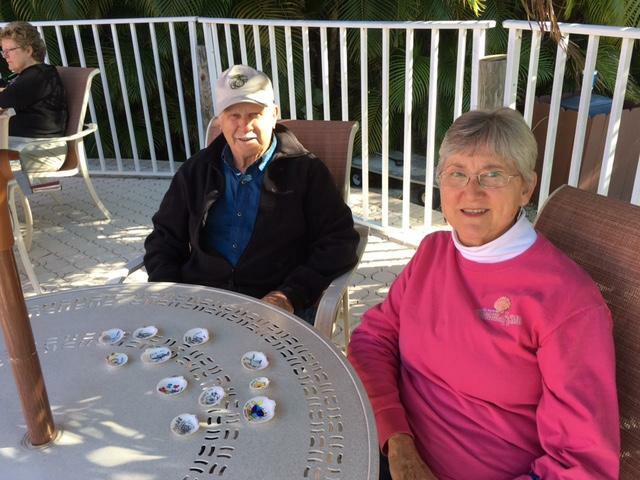 Together they created lots of original shell art to share with friends at Sanibel Arms this year! 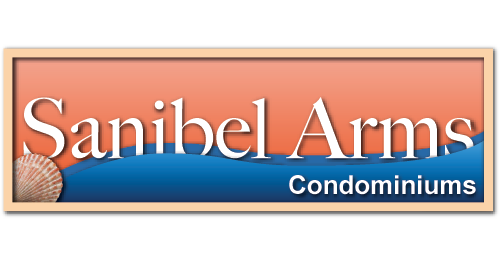 In fact, they are already planning a demonstration and maybe a class in shell art for next season at The Original Sanibel Arms! We cannot wait to see what our wonderful guests come up with from year to year. F2 is a 1 bedroom 1 bath direct Gulf Front condo with spectacular views of the Gulf of Mexico. The list price is $559,000. E2 is a lovely 1 bedroom 1 bath Beachside condo located near the clubhouse and pool and only steps to the beach path. The list price is $375,000. Spring and Summer! Please use Promotional Code: SA Specials when securing your reservation. 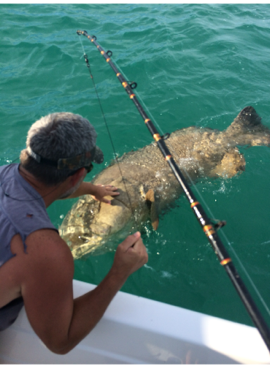 Book Online at www.sanibelarms.com or call 1-800-806-7368. Valid from: April 23 - August 20, 2016. What would it be like to live in paradise? Well, a 1,000 new people move to Florida every day to find out. And why not? After all, the average annual temperature of South Florida in the summer is 82.7 degrees, and 68.5 degrees in the winter. Indeed, sunny skies every day and balmy beach conditions relieve more stress than you'd think -- you'll never get back all that time you spent bundling up and digging your car out of the snow. But for some people, picking up and moving isn't an option quite yet. That's why beachfront condos and vacation rentals exist -- and there is no reason why you shouldn't take advantage of them. As soon as you arrive at your rental, hold the urge to flop down on the bed or dive into the pool and take pictures of every room. This will protect against liability from damage claims -- it is best to know the exact state of the home you arrived in. Before you arrive at the vacation rental, find out exactly what the housekeeping situation is like. Some hosts will have cleaners come every day, every few days, or only after you've left. 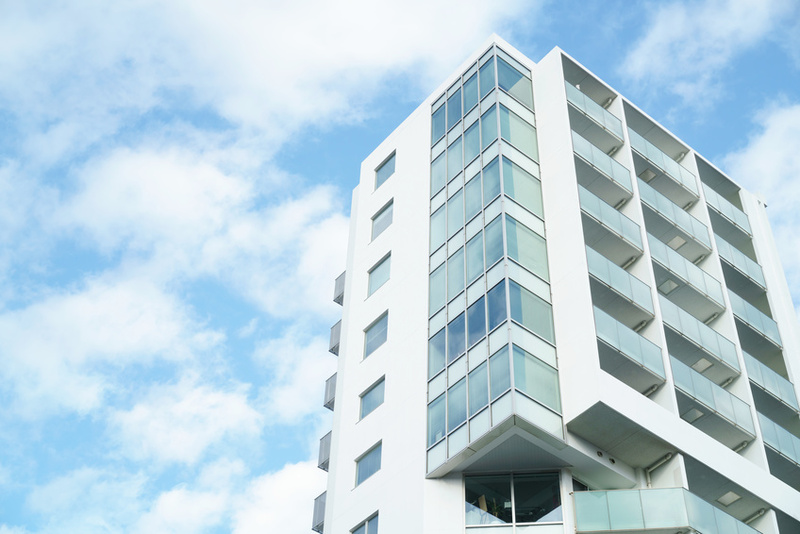 It is best to know exactly what the accommodations are and be able to negotiate a better arrangement earlier on. One of the best things about having a vacation rental is having a full kitchen at your disposal. Since this is your vacation, by no means will you be doing much cooking or meal prep -- but sometimes, it is more relaxing to nosh on fresh provisions (requiring no preparation) from the comfort of your own home-base instead of braving the crowds at a restaurant for every single meal. Not to mention, having snacks on hand for in-between times and on-the-go meals can be a real life, and money, saver. More than half (53%) of employed U.S. adults come back from vacation feeling refreshed, but what about the other 47%? It's easy to get caught up in the logistics of a trip, and to feel like you have to take advantage of your time off to do all the available activities. Schedule a couple of "dates" with yourself to do absolutely nothing in your vacation rental -- make it your new home away from home where you don't have to worry about cleaning or maintenance. Even if you need to sleep for 12 hours straight, use your vacation time to get rested and relaxed. How much do you know about the Sunshine State? Known for its warm weather, vacation condos, popular theme parks, and dangerous reptiles, Florida has always been a great destination for retirees and vacationers alike. The moonstone is the official state gem of Florida. However, moonstone is not native to Florida, nor was it found on the moon. 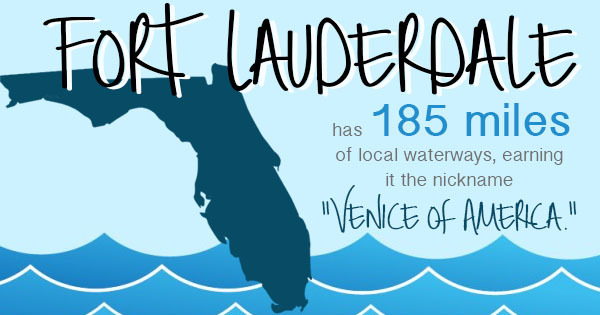 For Lauderdale has 185 miles of local waterways, earning it the nickname "Venice of America." Florida is home to two rivers both with the same name: The Withlacoochee in north central Florida and the Withlacoochee in central Florida. The state of Florida is 15,409 square miles larger than England, though most is made up of swampland. Both alligators and crocodiles live in south Florida, making it the only place on earth where the two animals coexist in the wild. The Florida Keys seceded from the United States in 1982, declaring themselves the Conch Republic. Prime Minister Dennis Wardlow declared war against the U.S., but within two minutes, he surrendered and requested $1 million in foreign aid. Sarasota is home to the only Amish beach resort in the world. Busloads of Amish and Mennonite vacationers flock to the neighborhood known as Pinecraft between December and April. The annual Interstate Mullet Toss is an event during which participants throw dead fish over the state line into Alabama. Only four states have lower taxes than Florida. With 87.3 million visitors in 2011, Florida is the number one travel destination in the world. The tourism industry has an impact of $67 billion on Florida’s economy. There are more than 1,300 golf courses in the state of Florida. As many as 1,000 new people move to Florida every day. Wherever you are in Florida you are never more than 60 miles from the ocean. Florida has 663 miles of beaches. In Florida it is illegal to sing in public while wearing a swimsuit. It is illegal for an unmarried woman to go parachuting on Sundays. Walt Disney World Resort is approximately the same size as the city of San Francisco. Key West has more bars per capita than any other place in the United States. For your next vacation, check out beachfront condos for rent on the beautiful shorelines of the country's southernmost continental state. See for yourself why Florida is the top travel destination in the world.